I was a little surprised that Netflix's efforts into original content had extended to facilitating actual documentaries beyond their usual haunts of science fiction and romantic comedy movies, to cite the usual suspects. This is not a documentary that they acquired the rights for but apparently a full-on Netflix original production. 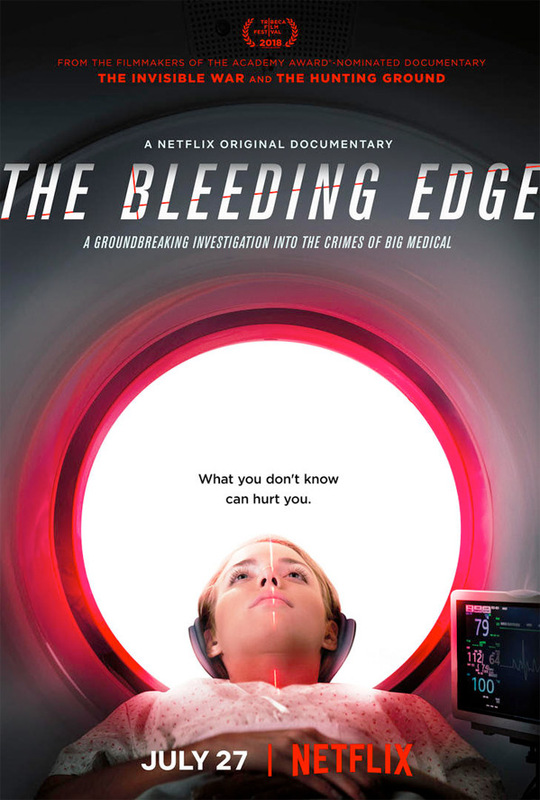 The Bleeding Edge is a rather unique feature that focuses on the medical device industry as opposed to yet another documentary about the horrors of the big pharmaceutical companies and all that jazz. Instead it feels like an effort to shine a spotlight on a legitimate problem that seems to have been allowed to spin off on its own with limited legitimate oversight. This is definitely one of those documentaries that leaves you feeling a little apprehensive about your next medical procedure or wondering about that relative who has had to use a medical device for one reason or another. I guess because it's such a relatable subject that ties to a very sensitive topic, this being healthcare, it all makes it easier to feel more directly affected by subject matter. Synopsis: The Bleeding Edge is a Netflix original documentary directed by Kirby Dirk, who also co-produced the documentary with Amy Herdy. The film had originally debuted at the 2018 Tribeca Film Festival and was later released on Netflix in July. We all know of the many regulations that govern the healthcare industry in the US ranging from what doctors can and cannot do, how pharmaceutical companies can advertise for their products or even how medical insurance companies figure out rates - all with their fair share of controversial provisions and loopholes. But outside of that and under a lot less scrutiny is the medical device industry that handles everything from hip replacements to anti-pregnancy devices. By following several cases for some very diverse devices, the documentary goes into detail of how the current approval system relies heavily on new patents being theoretically similar to older products and thus riding on past approvals in order to bypass more stringent review. And thus a lot of devices are rushed to market without significant testing and thus different side-effects come out much later now that the device is in widespread use. What I Liked: You can argue that the documentary may be a little sensationalist but really, I think the movie does a great job of highlighting a questionable part of the current regulatory environment. Sure the movie largely focuses on the US because they had to start somewhere but a lot of times other countries sort of use the US as a model and I'm sure similar problems exist elsewhere. And hopefully this movie will get to inspire people to do something about it. And I am impressed that they largely tried to be factual while at the same time going into a fair amount of detail without making it an overly scary gorefest. This is not to say that there aren't some bits that will make you feel a little uncomfortable. But still the editing decisions that determined what to show and what not to show were pretty on point. What Could Have Been Better: That said, I do wish there were more comparative discussions for how other countries had handled the same device. There were some instances cited where all other countries had banned a device while the US had not but that was not a consistent approach throughout the documentary. And I feel like there could have been a bit more effort put into getting the other side of the story or at least the opinions of other medical professionals who aren't necessarily aligned with the medical device companies nor aligned with the direct efforts to get these devices off the market. So it's a lot of gloom and doom and not as much explanation of what companies are actually doing for due diligence. They can't be 100% bad, right? TL;DR: The Bleeding Edge is definitely one of those documentaries that will really make you think twice and possible wonder what is being done about it where you live. And that's a striking feeling to leave with after watching something like this, and that speaks of its effectiveness. And thus the documentary gets a great 5 testimonials that start positive but turn negative out of a possible 5.